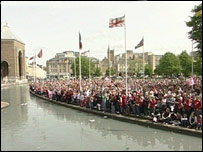 Bristol City's players are celebrating the club's promotion to the Championship with a boat and bus tour. The tour around Bristol started with a boat trip on The Matthew before the players boarded a tour bus. The eight-mile journey ended at College Green at about midday for a civic reception with the Lord Mayor. Bristol City's boss Gary Johnson was said he was "thrilled" at the team's 3-1 win over Rotherham at Ashton Gate on Saturday afternoon. The victory secured second place in League One and guaranteed automatic promotion. Johnson said: "On days like this, you see just what a big club City can be. "The support was fantastic and I couldn't have asked more of the players. I'm proud of each and every one of them. "It has been an amazing season, but the players have shown terrific character right to the last game."